Essential oils are safe when we use them correctly. It can be hard to know how much to start using when we're getting started. Quality and purity processes are taken very seriously, ensuring the extreme potency remain intact from plant to person. With such potency, you must follow important guidelines to keep your household safe. Here is a great place to start. There is no limit for aromatic usage so diffuse away mama! Oral use is referring to drinking essential oils or putting them directly under the tongue. Internal usage is referring to placing oils in a veggie cap. When starting with dermal (or topical) use, start with 2-3 drops and work your way up. Ideally use oils 4-6 hours apart. Fewer drops more frequently are the best approach. When you consume or absorb essential oils, your body employs complex chemical reactions to metabolize the oil. It is possible to overwhelm this process. If you exceed your bodies natural metabolic capacity (you absorb oil faster than your body can break it down and process it). Remember that it is never desired or appropriate to exceed the metabolic capacity of the cells. Using an essential oil in the way and amount that it was intended will help you prevent overwhelming the body with incorrect essential oil levels. Avoid applying oils directly to the nose, ears, or around the eyes. Consider dilution when applying oils topically. Dilution helps you avoid sensitivity with essential oils, and is particularly helpful for young or small children, or those with sensitive skin. It is also important to remember that some essential oils (Cassia, Cinnamon, Geranium, Lemongrass, Oregano, and Thyme) should always be diluted before topical use. Make sure to store essential oils out of the reach of children to prevent accidental ingestion. Store oils away from excessive light or heat, because this can alter the chemical properties of the essential oil significantly. 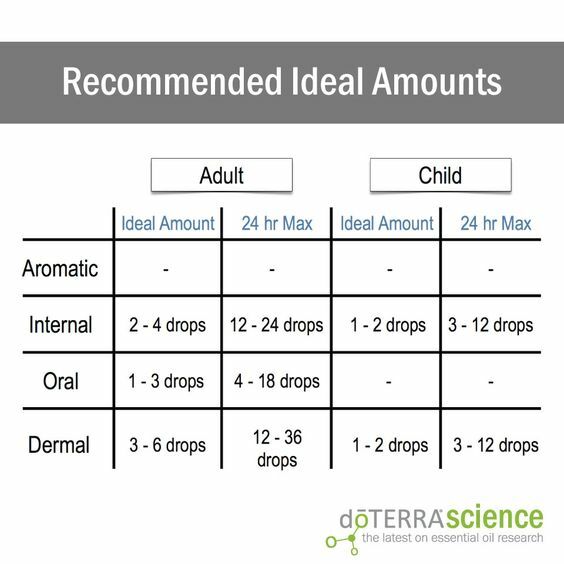 Always help younger children apply essential oils to make sure they get the proper amount. It is also a good idea to encourage teenagers to set a good example for younger children by always following guidelines for proper usage.